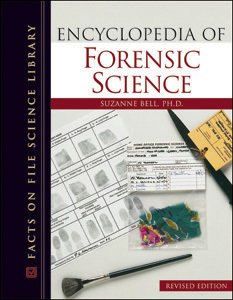 Authored by: Suzanne Bell, Ph.D.
Society of School Librarians International "Honor Book"
Gathering the core topics of forensic science into one comprehensive volume and providing an overview of each, this edition of the award-winning original features approximately 650 entries, more than 80 new to this edition. More than 12 essays are interspersed throughout this reliable A-to-Z reference, describing how forensic science relates to areas such as drug testing in sports, privacy concerns, misconceptions about forensic science, and the interface of forensic engineering and forensic science. Encyclopedia of Forensic Science, Revised Edition is richly illustrated with more than 200 black-and-white photographs and illustrations, plus a full-color insert containing photographs with depictions of firearms, tool marks, and DNA analysis. Most of the photographs were supplied by working forensic scientists in many different organizations. With updated appendixes aiding further research, this essential revised edition will remain the ultimate primer in the subject of forensic science for high school and college students alike. “…concise, easy to digest…suitable for most libraries…an excellent introduction to and starting point for research into forensic sciences." "...fills the need for accessible, accurate information on a popular topic...Recommended for public and academic undergraduate libraries as well as high school libraries."